JayDean Ludiker leads a group lesson at her studio in Spokane Valley. Back and forth, their bows glide across violin strings; hands noodle over fingerboards. But for all the effort, the students can't quite keep the rhythm. "I can tell we've had two weeks off. That was terrible," a smiling JayDean Ludiker tells the semicircle of kids in her home's sunny basement. "Let's try that again." The group of a dozen preteens and teens, clad in shorts and flip-flops, take another stab at the fiddle tune "Swallowtail Jig." Ludiker keeps the tempo, strumming along with her guitar. This time, they play steady. "Good job, you guys!" she exclaims, flipping her long, chocolate-brown hair behind her back. "Who wants to play a solo?" That's how Ludiker's group classes tick — perpetual motion. Sometimes the students clamor to play a solo in the middle of the group; next they'll start singing midway through a group number like "Edelweiss." There's fidgeting, giggling, and most important, no parents allowed. Practicing in groups, Ludiker says, instills the collegial nature of fiddle playing. Ludiker, a national fiddle champion, has been teaching group and private lessons like this for decades, producing national champion-caliber players and casual fiddlers alike. In the fiddle world, the Spokane area is known as a hotbed of talent, and much of that has to with what Ludiker's family started. Her father taught her how to play, her grandfathers played before him and now her children have left the nest, establishing bluegrass bands of their own. After 30 years as a teacher, Ludiker continues to inspire new generations of kids to take up the fiddle. 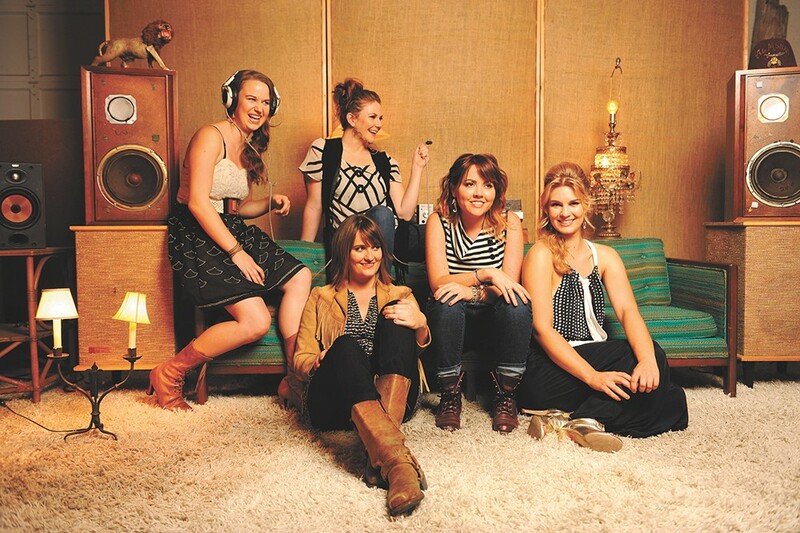 Grammy-nominated Della Mae, which features JayDean Ludiker’s daughter, Kimber (seated on the floor). "I suppose you'll want the tour," Ludiker, 50, says, not a minute after opening the door of her Spokane Valley home and studio, where more than 100 students take lessons in any given week. Almost everything in the house is somehow fiddle-related — violins of varying ages and lengths adorn the walls and a blanket-sized tour poster for her daughter Kimber's bluegrass band, Della Mae, hangs in the stairwell. The basement is lined with fiddle records, family photos and Austin, Texas, memorabilia. So much of the split-level house has been overtaken by her business, Ludiker Music, that only a bedroom and bathroom are hers alone. What once were spare bedrooms have been transformed into storage space for lessons and rental instruments. The dining room holds the inventory of the six fiddle books she's written. She's considered getting a separate storefront, but this is the way she likes it. Ludiker dedicates four 10-hour days to teaching, with Friday reserved for a business catchall day. On the weekends she's either gigging, jamming, judging or attending some sort of fiddling event. If you know where to look, she says, you can find a fiddle engagement almost every night of the week in the Inland Northwest. While people definitely played fiddle in the region, Ludiker says she was the first fiddler to take up teaching in the area back in the 1980s. The goal, she says, was never to be the most influential fiddle teacher in the region; it was something she started out of necessity. Marrying young at 19, to five-time national fiddle champion Tony Ludiker (they divorced 12 years ago), she soon realized that being a stay-at-home mom wasn't feasible. She started teaching out of her home, creating her own method using a series of tablatures — similar to guitar tabs — that allow a person of any age to learn the fiddle (she has students aged 3 to 78). Thumbing through her instructional books, each piece is written out as sheet music as well as tabs. An accompanying CD allows students to listen to a song incessantly until they hear the correct rhythms and melody in their heads. 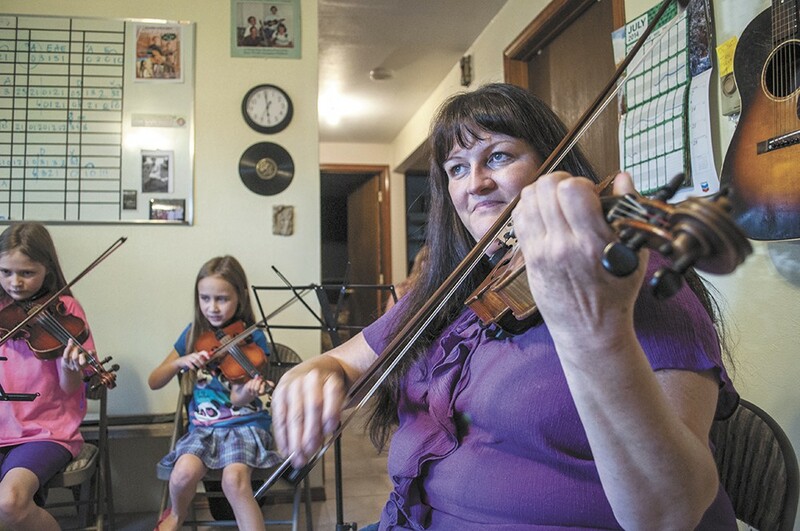 As word of mouth spread, she couldn't keep up with the demand of people wanting to learn fiddle, even when classical teachers were skeptical of her method. But Ludiker insists that she teaches proper classical bow holds, hand and wrist placements. "It's not like that stereotypical old man hunched over a fiddle," she says. "My players are taught to hold the instrument correctly." She first learned to play fiddle from her father Lloyd J. Warner, who was mostly self-taught and learned playing by ear. The 11th of 13 kids, she didn't start until age 10, but was immediately obsessed. She'd practice until her fingers bled, building up tough calluses. "I showed my mom my fingers once, and she told me I maybe shouldn't practice so much," Ludiker remembers. But all of that practicing paid off when she won the national junior title at 17 and women's national fiddle title the next year (the women's category has since been combined with the men's). Even coming from such a prestigious lineage, she wasn't sure her children, Kimber and Dennis, should start playing fiddle until they were older, but after Grandpa Warner saw them trying to play their parents' instruments, he gave them each their own — at age 3. The siblings can't remember a time when they didn't play the fiddle. The night before his first day of kindergarten, 5-year-old Dennis gathered his essentials — his fiddle and a backpack stocked with crayons and markers — and placed them near the door. It was then that his parents had to sit him down and break the news that not every other child in class would know how to play the fiddle. "You should have seen the look on his face when he realized that he wouldn't be able to jam with everyone else," Ludiker recalls. Who could blame the kid? He grew up in a house where the instrument was king. When the family stepped out of their front door, they brought their fiddles, whether it was to family gatherings or weekend fiddle festivals with friends. That's why friendships at the National Oldtime Fiddlers Contest & Festival in Weiser, Idaho, every June were so important. Here was a place where everyone understood wanting to play fiddle all the time. Three of the four members of Dennis' jazz-grass band MilkDrive — he plays mandolin — first met as fellow competitors at the contest. Now 30 and living in Austin, his first fiddle partner will always be his sister Kimber, just 14 months younger. Even though they grew up in a fiddle family, they had to choose for themselves if they wanted to pursue music. "It's important to note our parents never pushed us," says Kimber, on a lunch break at the RockyGrass bluegrass festival in Lyons, Colorado, last week. If anything, over the past 10 years, Ludiker says her kids are the ones pushing her. Dennis, as a non-native Texan, has won the Texas state fiddle championships three times in the past eight years. In January, Della Mae was nominated for a Grammy in the Best Bluegrass Album category. As her daughter's date to the event, Ludiker got to walk the red carpet. "It was crazy, unbelievable," she says. Although Della Mae didn't win, Kimber's boyfriend's group, the Del McCoury Band, did. "I've never been more proud to have my mother as a guest," Kimber recalls. Kimber, who now resides in Nashville, says that throughout her travels — Della Mae played more than 200 dates last year — even if fiddlers haven't heard the Ludiker name, they usually know that a bevy of fiddle players have come out of the Spokane area. In the Ludiker family, it's known as Christmas. The Oldtime Fiddlers Contest & Festival is so much of a family affair, fiddlers from all over the nation arrive on Wednesday for an event that will begin on Sunday, to stake out campsites, reunite with old friends, rekindle romances and rivalries and most of all, jam together. This is the place where over the course of six rounds, playing three songs at a time, a fiddler can become a champion. Ludiker was a junior champion at just 17. Her daughter would win that award at 16. Kimber would go on to beat out her own father, winning the overall national grand championship in 2009 and 2010. Year after year, area students of Ludiker or one of her protégés make the trek down to Weiser to go for the win. Often, they're successful. Cindy Campbell, judging chairman for the Weiser fiddling contest who has known the Ludikers for more than 30 years, says the reason Spokane has been so successful for fiddlers is because of the encouraging atmosphere. "I think community has really made the group what they are in Spokane. They aren't bickering with each other, and other groups do," Campbell says. When Ludiker turned 50, she didn't have a birthday party. Instead, she threw an anniversary party and carnival for the 40 years she's been playing the fiddle at Rockin' B Ranch in Liberty Lake. Fiddlers from all over the nation came to help celebrate. These days, she says, the word "fiddle" is becoming far more acceptable to the classical world, as is the influence of bluegrass and folk music in pop culture. People are understanding that the fiddle is a tool to play many different genres, classical included. For Ludiker, the educational process isn't over. "I haven't learned enough fiddle tunes yet," she says. "This music is contagious; you're playing what you've put your heart and soul into. You cannot buy this kind of entertainment." And with her first grandson, Mason, newly born to Dennis and his wife Heidi, she has a new student to teach. She whips out her cellphone to show off a photo of a pint-sized violin.